Porto is a historic city that has several times also been named as one of the world’s best cities to visit. And rightly so, Porto is a bustling city that offers a mix of new and old. The town is full of old buildings with spectacular architecture, and there are always things to do in Porto. The nightlife is also well known with plenty of bars and clubs. There is also a wide selection of restaurants and cozy cafes. Here’s a comprehensive list of my favorite attractions and things to do in Porto as a tourist. Porto is the only place in the world where Port Wine is produced, and like Champagne in France, it’s only allowed to be called “Port wine” if it is coming from Porto and Douro Valley. To go on a wine tasting tour in Porto is something that everyone should do. There are several wine cellars to choose from. I visited Croft, which is the oldest Port Wine manufacturer in Porto. The wine tasting tour costs 7 euros per person and includes samples of 3 different port wines, a rosé and two red port wines with various ages (5 and 10 years old). If you want, you could also join the wine cellar tour (included in the ticket price) where you can learn more about the port wine and the production itself. 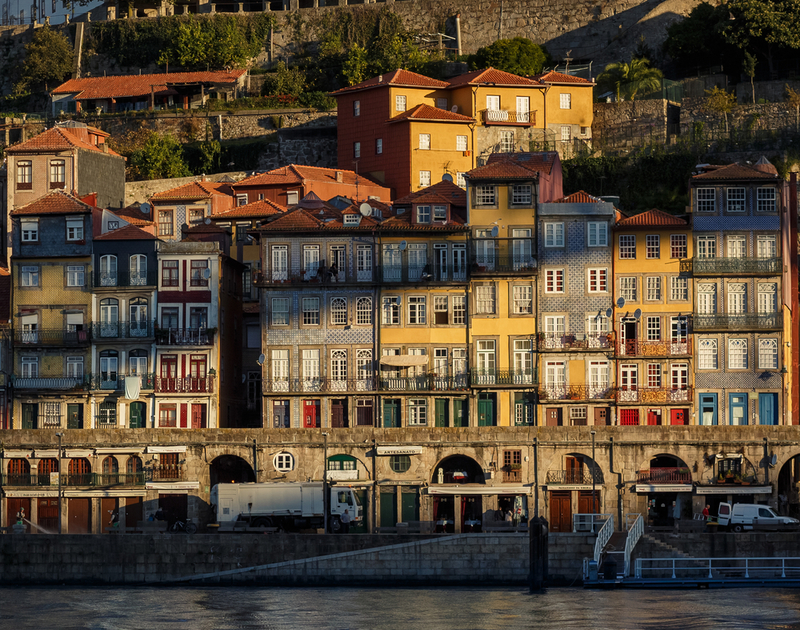 An old but lively neighborhood that runs along the Douro River. The area is characterized by its narrow houses in cheerful colors, small alleys and all the cozy cafes and restaurants. It is also here you will find several of the city’s wine cellars and manufacturers. 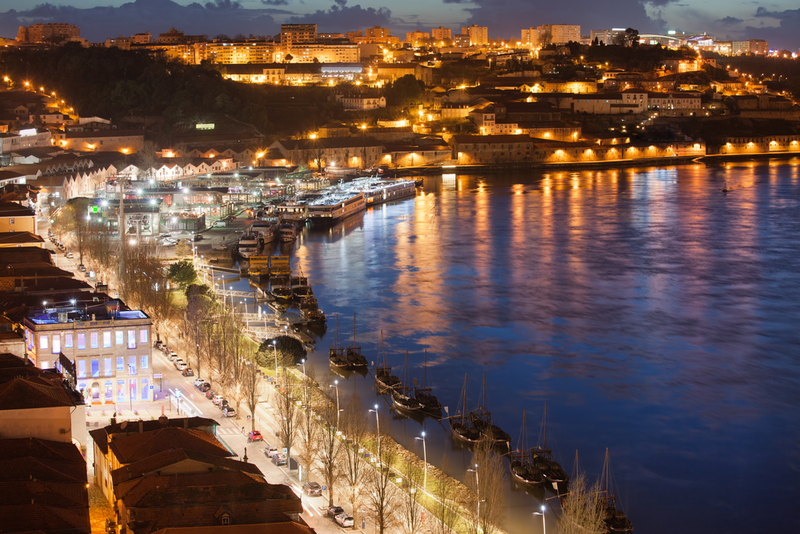 Zona Ribeirinha is full of people both during the day and towards evening, perfect for people watching or a romantic dinner overlooking the river. Along the waterfront, there are also several stalls selling crafts and souvenirs. You could say that this is a city within the city since they are connected through the famous bridge Ponte D. Luis I. In Roman times, the city was known as Cale Gale and originates from a Celtic settlement, possibly even back to the Stone Age. Just when you come over the bridge, you can see the Serra do Pilar Monastery on top of the hill. From the monastery, you can enjoy one of the best views of the city. A bridge that has become a classic landmark in Porto which both offer a beautiful view and spectacular architecture. The bridge and the surrounding area is a real dream location for photographers. The bridge takes you across to the other side of town, to Vila Nova de Gaia and it is possible to walk or take the metro across the bridge, even cars are allowed on the bridge’s ground level. Walking is accessible both on top of the bridge and down at ground level. Porto has one of Europe’s best nightlife and towards evening the city is transformed into a real party destination. The main party can be found at Rua Galeria de Paris and Rua Cândido dos Reis, where most of the bars and clubs are located. For a more quiet evening with good drinks, one should instead go to Zona Ribeirinha, where you can enjoy a traditional Portuguese “Fado” (bars that play folk music). Are you looking to party all night, I recommend that you go to one of the many pub crawls organized by the different hostel in the city. Several companies offer boat trips along the river. Some will take you to the Douro Valley, while others just go a short distance. A boat trip that takes you up to the vineyards and the wine terraces is something I warmly recommend anyone visiting Porto. Most boats who go there usually include either breakfast or lunch. The Boats depart from various points along the river. It’s not every day that a train station is a given attraction in a city. But Porto’s train station São Bento is something extraordinary. 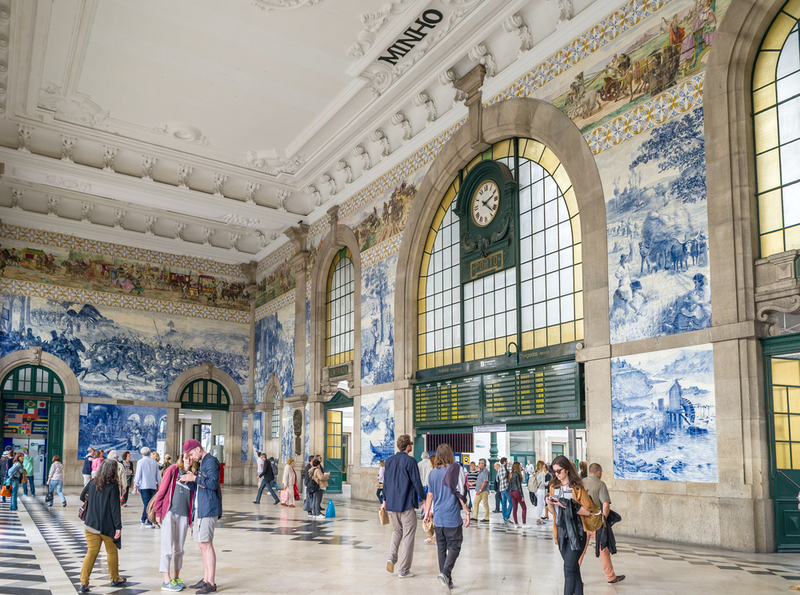 Thanks to its beautiful tile murals and the historic atmosphere, this station has become a popular tourist attraction in Porto. And since it’s the central railway station; there is always a lot of movement, which enhances the experience further. It is also from here that many trains are departing from to other cities in Portugal. Porto is a great city with many attractions and beautiful buildings; thus it’s easy to miss a few of them. The free city walk is perfect for those who want to be sure not to miss anything. The guides in this tour are passionate and very knowledgeable about their city, And, Sure, you can explore the city on your own, but sometimes it can be fun to get to know more about the city’s buildings, especially in Porto where there is so much history behind everything. In Porto, you can watch FC Porto play football. One of Europe’s most prestigious football clubs, which over the years have produced and developed many of the greatest football players of all time. They usually also go far in European cups, so if you are in Porto during the Champions League season, there is a good chance to see the real top football of Europe. The club’s supporters are really dedicated and it’s a special feeling to see the team play and hear the audience sing. Moreover, I can also recommend going to a Portuguese football derby when FC Porto faces Benfica or Sporting Lisbon. This bookshop has become famous for its spiral stair and beautiful architecture. It was also here that the author of Harry Potter got her inspiration to create Hogwarts. Entrance fees are 2-3 euros if you just want to go in and have a look. Greasy, delicious, impressive and above all incredibly satisfying is a pretty good description of the local dish Francesinha. It’s available almost everywhere, but it is best to go to a place that specializes in Francesinha. There are different variations, but most of them contain bread, sausage, ham and lots of cheese. You also get fries and a sauce made of tomato and beer. Porto’s Cathedral offers a magnificent architecture, and the inside is full of beautiful ornaments and precious relics. The cathedral is one of Porto’s oldest buildings and originates from the 1200s. However, it was not until the 1600s that it got its present appearance. The building looks more like a fortress than a church, and from here you also get a beautiful view of the city. It’s always fun to get lost in a new city and just stroll around and discover things at random. In Porto, it is, even more, fun since it’s fully packed with historic buildings and narrow alleyways with colorful houses. No matter where you go in the city, it’s not long before you find something interesting. Porto’s main shopping street is located along the Rua Santa Catarina, where shops are lined up one after another. In the middle of the street, there’s also a small shopping center. A beautiful church which decorated with paintings and traditional blue ceramics, also known as Azulejo. To visit this church might not be one of the must things to do in Porto, but if you have time, or like architecture and beautiful buildings, Carmelitas Church is well worth a visit. Looking for a more action-packed experience, you can go rafting, kayaking or canoeing. You can also swim in the blue lagoons and hike near Porto. Oporto Adventure Tours offers guided adventure tours suitable for different ages. A famous landmark in the city that is located near the railway station São Bento. From here you get a fantastic view of the city. If you’re looking for a music experience, the Casa de Musica is the place to go. The building itself is also worth a visit if you are interested in architecture. North of Porto is the industrial town of Matosinhos, which is mainly known for serving delicious fish and seafood dishes. It is easily accessible via bus, which departs from several locations in Porto. A fun experience, especially if you are traveling with children but in my opinion not worth the money. The cable car is only 600 meters long and costs 5 euros per person one-way, or 8 euros for a roundtrip, so, quite expensive, since it’s only a short ride. However, you get a spectacular view of Porto and the Douro River. You will find the entrance to the cable car just to the right when you walk across the Pont D. Luis I bridge towards Vila Nova de Gaia. Travelsim keeps you connected in Portugal. Stay online and share your travels pictures in Portugal with 1 GB data plan.